In a place with as many hills and slopes as New Jersey, it makes sense to build retaining walls to protect your property from soil erosion or increase its usability. A high-quality retaining wall can even add visual interest to your yard. Brick by Brick Pavers and Landscaping has been specializing in retaining wall design and construction for residential and commercial clients for over 10 years. Our retaining wall specialists are knowledgeable and skilled in constructing all types of retaining walls. We will construct walls that do not only provide the much-needed functionality in your outdoor area but also complement and enhance the surrounding landscape design. We also design and build walls based on your specific needs, using high-quality products to ensure a strong and attractive finished structure. Structural retaining walls. They are built for a specific function for your property. They are used to prevent soil erosion, handle water drainage issues, create different levels in a garden, maintain a slope, and support vertical grade changes. Decorative retaining walls. 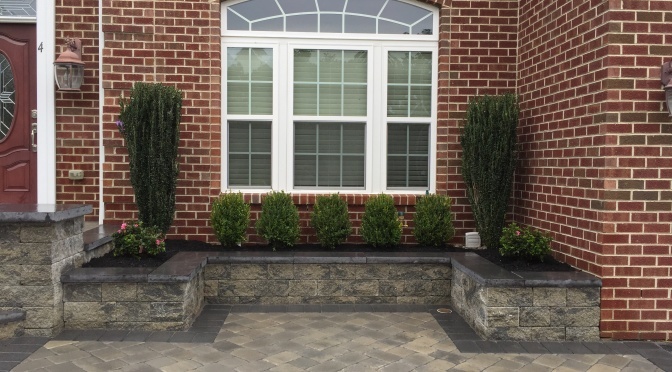 We can also build decorative or accent retaining walls and landscaping tiers to add usable space and beauty to your outdoors. They can be used to accent certain garden features, as base for a fence, or even as seats, such as around a tree. There are a few different ways to build a retaining wall. At Brick by Brick Pavers and Landscaping, we specialize in mortared masonry using concrete blocks. This technique guarantees better structural integrity than the dry stone method. Superior strength – Techo-Bloc segmental retaining wall blocks are made of high-strength modular concrete units. These units are dry stacked then interlocked with pins. This unique design allows builders to construct steeper walls without compromising structural integrity. Our retaining walls can provide adequate retention and slope support. They are strong enough to support the force of lateral earth pressure. Customizable. The Techo-Bloc segmental retaining wall blocks are available in a wide array of colors, sizes, textures, and patterns. This allows us to create retaining walls that complement and enhance the surrounding landscape design. They can be arranged to create straight, curved, or circular walls, and even steps and corners. Versatile. Segmental retaining wall blocks can be used to create walls for functional purposes, such as widening driveways and supporting grade changes, as well as for creating decorative or accent walls. While it’s possible to build a retaining wall yourself, you may not be able to address issues such as drainage and structural strength. To ensure you get reliable results, take advantage of the retaining wall building services of Brick by Brick Pavers and Landscaping. Call us today for a free quote!